'Mighty Morphin Power Rangers' Vol. 3 takes the franchise to new heights – AiPT! BOOM! Studios is on a hot streak with Mighty Morphin Power Rangers. If you haven’t read anything before issue nine have no fear, one of the most interesting stories in Power Rangers history starts here in Mighty Morphin Power Rangers Vol. 3. Power Rangers Volume 3 is a small collection consisting of issues #9 through #13. Each issue is powerfully written by Kyle Higgins and Steve Orlando and illustrated beautifully by Hendry Prasetya and Corin Howell. Each comic feels like magic. There’s never been a more interesting story in Power Rangers history. Every fan growing up only fantasized about stories like these. One thing Power Ranger fans love is a new Ranger making their debut as a part of the team or seeing a Ranger become a new Ranger and in these issues we get that, but with some exciting and dramatic events where Tommy lends his Green Ranger powers to the the team and now each member is now a team of green Power Rangers. Absolute genius writing, and who would have ever thought of doing something like that? Volume 3 also introduces probably the most interesting character in Power Rangers history, and that’s Lord Drakkon the new evil White Ranger. This is a perfect set of issues to have even if you haven’t read any previous issues. Some very interesting sides of Goldar are shown that we haven’t seen before which is very nice to see because mostly everyone who remembers this character just remembers the villainous right-hand man who just yelled about how much he hated the Power Rangers. Tommy as always is interesting, but in a more human way. Seeing Tommy go through trauma after being cured of Rita’s spell feels more real rather than just being your normal teenage superhero with no problems after just one episode on television. You can see the frustration and maybe even depression in Tommy’s expressions and it’s actually very moving because it’s not something you would expect from a Power Rangers story. That’s the exciting part of this volume–it takes your childhood and brings it back in a more mature way without drastically changing what Power Rangers was originally to fans. Every Ranger has their personal issues unlike the show that didn’t focus too much on it. When anyone from the group had any problems, it felt like all they had to do was morph and they were all equally as powerful and brave. Billy was a coward for only a few episodes and when he’d morph he was a hero. In here you get to see that’s all changed and just because you have powers, doesn’t mean you’re not afraid. There’s not much bad at all to say about these comics. Power Rangers Vol. 3 is a must read volume. Read them and pass them along to your friends because we need more comics like this. BOOM! knows exactly what to do with this series and is taking it places Power Rangers fans couldn’t even dream of because we never expected to ever see anything this intense from a 90’s television show that was mostly stock footage. Everyone involved in this volume is a Power Rangers dream team who knows exactly what to change and add to the Power Rangers universe without tarnishing the legacy. Some of the best images in Power Rangers history are in this volume. So well crafted that if the reader was shown these without context or knowing where the source was, they would believe it was too good to be a real thing that could happen in Power Rangers. As good as a story can be, this volume proves it can only get better. The final pages are so ground-breaking that your heart may just skip a beat or two. It’s that damn good. 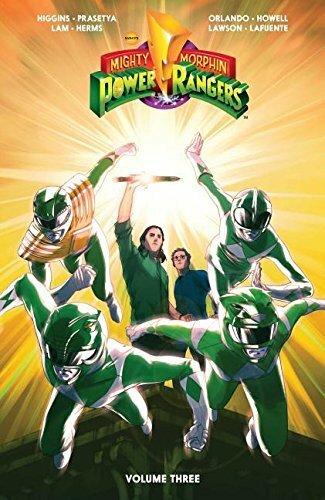 Mighty Morphin Power Rangers Volume 3 is the perfect chapter to begin a new and exciting era that Power Rangers fans could previously only dream of. The introduction to the Lord Drakkon is one of the most jaw dropping moments in Power Rangers history. Seeing a real take on these characters and their personal issues is one of the best parts of this series.